Do you want to build your skills in the business of science and research? Are you interested in a career in industry research? Attend this full-day workshop to identify and develop your skills in The Business of Science, Communication, Financial Literacy, Negotiating, and Project Management. 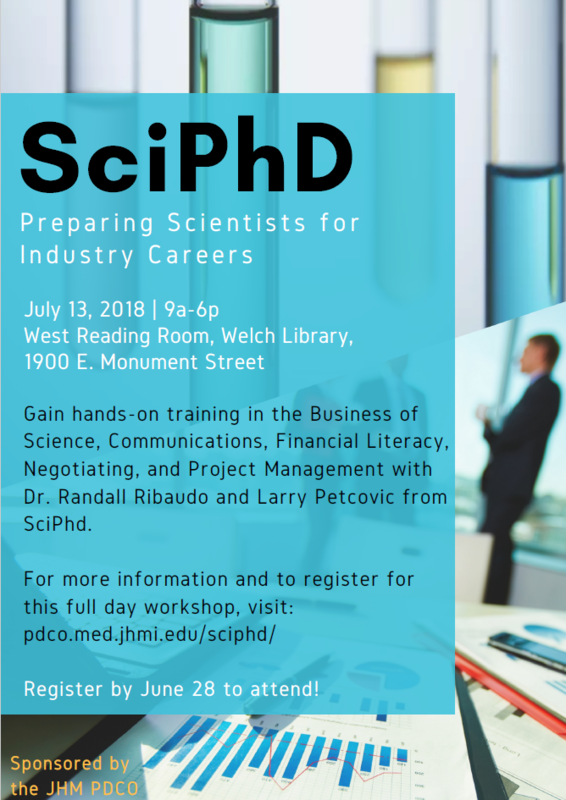 Dr. Randy Ribaudo and Larry Petcovic, co-founders of SciPhd, will lead this interactive workshop on the professional skills needed to be successful in a career in industry. This workshop is open to all graduate students, postdoctoral researchers, faculty, and staff. For more information and to register, visit pdco.med.jhmi.edu/sciphd or click the image above. SciPhD is NIH-approved and has worked with universities, societies, and agencies across the country, including the National Cancer Institute, New York Academy of Sciences, UCSF, and SACNAS, among many others, to help trainees prepare for careers in industry. To learn more about SciPhD, visit http://sciphd.com/. Register HERE by June 28.